The St.Croix Forge Concorde Steel shoe offers the same front and hind shapes as our Aluminum Concordes. A deep perimeter crease, rolled toe and softened outer edges provide traction and durability in a lightweight steel option. It is a good alternative for those who look for a stronger and more durable option to the aluminum shoe. 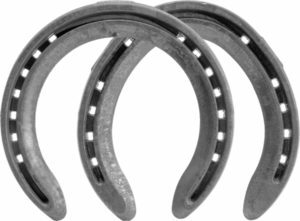 It is an ideal shoe for young Thoroughbreds getting their first set of shoes and is punched for a RN4 nail. 1-9 $3.90/pr. 10-29 $3.60/pr. 30+ $3.50/pr. 1-9 $4.05/pr. 10-29 $3.75/pr. 30+ $3.65/pr. 1-9 $4.25/pr. 10-29 $3.90/pr. 30+ $3.85/pr. 1-9 $4.45/pr. 10-29 $4.15/pr. 30+ $4.05/pr.